The Monk Who Sold His Ferrari (Hindi) or Sanyasi Jisne Ani Samati Bech Di is a source of spiritual reawakening, that will teach readers how to examine life from a different viewpoint. 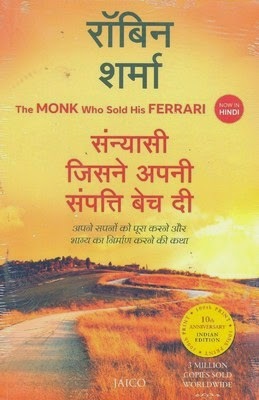 The Monk Who Sold His Ferrari (Hindi) teaches readers how to develop wisdom that enables them to live life in balance, abundance, joy, and courage. Julian Mantle is the protagonist of Sharma’s masterpiece. Presented through a fable, Julian faces a spiritual crisis which develops due to an unbalanced lifestyle. As a result, he embarks on a spiritual journey to a primal culture where he learns about wise and practical life lessons. Through Julian Mantle’s inspiring tale, Sharma presents a step-by-step tool which will help readers learn how to lead a meaningful life. This tool contains what the author dubs as 7 Virtues of learning. These are mastering the mind, following one’s purpose, practising kaizen, living with discipline, respecting time, embracing the present, and selflessly helping others. According to Sharma, by developing these 7 core virtues, people will learn to follow their life’s purpose, develop pleasant thoughts, nourish relationships, cultivate discipline, and value time. After reading The Monk Who Sold His Ferrari (Hindi), readers will learn to delve deeper into themselves and retrain their minds. More importantly, the book helps one understand how daily habits can help one accomplish his or her dreams. By mastering Sharma’s 7 core virtues, readers will learn to follow their desires and fulfill their destinies. Since the book’s initial publication in 1997, it has sold more than three million copies worldwide. The book has been translated into 42 languages, and has been a Number 1 bestseller. Robin Sharma is an author, lawyer, motivational speaker, and leadership expert. He has authored numerous self help bestsellers. Some of these are Who Will Cry When You Die?, The Saint, the Surfer, and the CEO: A Remarkable Story About Living Your Heart's Desires, MegaLiving: 30 Days To A Perfect Life, and The Gandhi Factor. Sharma is a lawyer by trade. He is also the founder of Sharma Leadership International Inc., which is located in Toronto, Canada. Sharma received the Golden Gavel award in 2011 from Toastmasters International. He has also appeared on many radio programs and television shows.